Resource groups are a way to create a logical group of resources associated with a particular workload such as different layers of an application stack, or production versus development environments. For example, you can group different layers of an application, such as the frontend web layer and the backend data layer. Resource groups can be created, updated, or removed programmatically through the API. 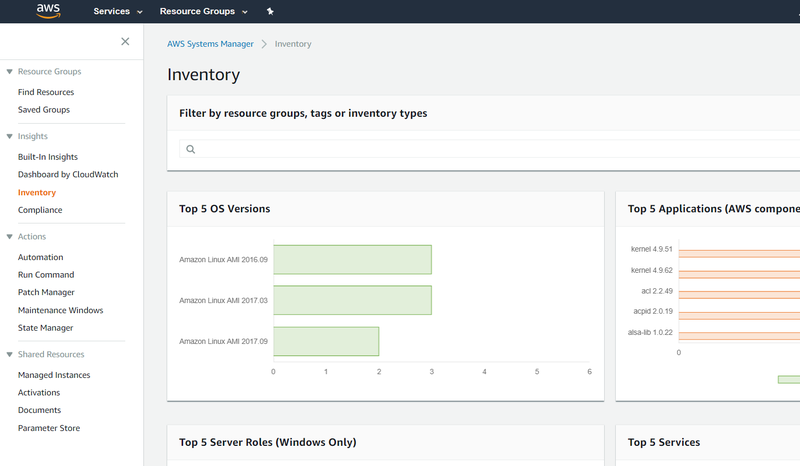 AWS Systems Manager automatically aggregates and displays operational data for each resource group through a dashboard. Systems Manager eliminates the need for you to navigate across multiple AWS consoles to view your operational data. With Systems Manager you can view API call logs from AWS CloudTrail, resource configuration changes from AWS Config, software inventory, and patch compliance status by resource group. You can also easily integrate your AWS CloudWatch Dashboards, AWS Trusted Advisor notifications, and AWS Personal Health Dashboard performance and availability alerts into your Systems Manager dashboard. 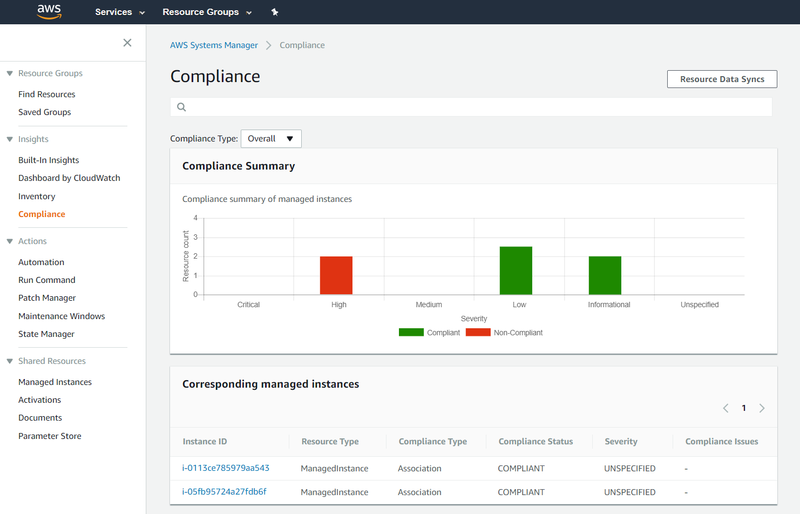 Systems Manager centralizes all relevant operational data, so you can have a clear view of your infrastructure compliance and performance. AWS Systems Manager allows you to safely automate common and repetitive IT operations and management tasks across AWS resources. With Systems Manager, you can create documents that specify a specific list of tasks or use community published documents. These documents can be scheduled in a maintenance window, triggered based on changes to AWS resources through Amazon CloudWatch events, or executed directly through the AWS Management Console, CLIs, and SDKs. You can track the execution of each step in the documents as well as require approvals for each step. You can also incrementally roll out changes and automatically halt when errors occur. AWS Systems Manager provides a browser-based interactive shell and CLI for managing Windows and Linux EC2 instances, without the need to open inbound ports, manage SSH keys, or use bastion hosts. Administrators can grant and revoke access to instances through a central location by using AWS Identity and Access Management (IAM) policies. This allows you to control which users can access each instance, including the option to provide non-root access to specified users. Once access is provided, you can audit which user accessed an instance and log each command to Amazon S3 or Amazon Cloud Watch Logs using AWS CloudTrail. AWS Systems Manager helps you securely distribute and install software packages, such as software agents. Systems Manager Distributor allows you to centrally store and systematically distribute software packages while you maintain control over versioning. You can use Distributor to create and distribute software packages and then install them using Systems Manager Run Command and State Manager. Distributor can also use Identity and Access Management (IAM) policies to control who can create or update packages in your account. You can use the existing IAM policy support for Systems Manager Run Command and State Manager to define who can install packages on your hosts.